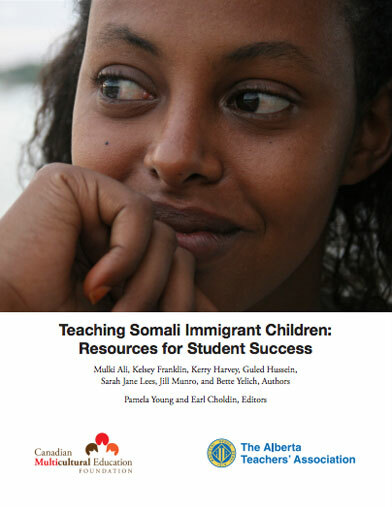 In a number of Canadian cities and towns, educators are receiving large numbers of Somali refugee and immigrant students in their classrooms. Immigration is a profoundly disruptive life transition requiring extensive adjustment and adaptation. These students may arrive with severely limited English language proficiency, and may have endured stressful socio-economic and emotional experiences. These experiences may contribute to negative attitudes towards school, poor behavior, lower academic performance and increased absences. Educators too may experience stress in their interactions with Somali students, due to the lack of a support system to understand the values, beliefs, backgrounds and socio-economic conditions of these students. This document was developed by Alberta teachers to assist classroom teachers and school administrators throughout Alberta to better understand the culture and needs of Arab immigrant students in their schools.Comments and suggestions from readers and users will be appreciated. Please send them to: Earl Choldin. Somalia is one of the oldest nations in the world. It is located in east Africa, near Kenya and Ethiopia. The country is about the size of Texas, with an estimated population of 10 million people. Somali people are Muslims. All social norms, attitudes, customs, gender roles and interactions are derived from Islamic traditions. Somali food is low in calories and high in protein. As Muslims, Somalis do not eat pork or drink alcohol. Somali families and friends eat with their hands and use a shared plate. The family is deeply valued in Somali culture. Males are considered the head of the family. Women play important roles in decision making about children’s education, health care and participation in social activities. Somali people share common ancestors, culture and beliefs, and a common language and religion. Before Western colonization, the Somali education system was based on religious studies. During the colonial era, a Western education system was introduced. Primary education was made available to all people. However, higher education was limited and out of reach for most. From the 7th century until the 19th century when European colonization occurred, Somalia was a vibrant nation and an important trade centre, linking Africa, Arabia and India. In the 1960s the country gained independence from its British and Italian colonizers. From 1970 to 1990, Somalia was ruled by a military dictatorship and the country became one of the most advanced military powers in Africa. Then the military government collapsed and civil and tribal war started, which continues to the present day. The civil war has affected every aspect of Somali society including disintegration of families and communities, displacement of the entire population, and the destruction of the economic system, education, and health services. These fallouts of war have taken a heavy toll on children’s lives. Before arriving in Canada, most Somali newcomers lived in refugee camps in Kenya for more than 10 years. They have been subjected, either directly or indirectly, to many kinds of physical and mental abuses. These abuses have severely impacted children’s lives. Childhood becomes a nightmare experience in refugee camps. There are no formal schools, programs or stable individual family homes. Children are continually exposed to abuse and witness the inability of their parents or other important adults in their lives to make changes or take action. The experience of life in refugee camps has contributed to many children’s sense of fear, lack of confidence, and trust in authority. For the most part, newcomers enjoy being in Canada and dream of rebuilding their family’s lives. However, they face tremendous challenges starting life in a new country. Although there are no official statistics, most Somali newcomers are unemployed and live below the poverty line. The majority of Somali people came from rural backgrounds and were nomads or farmers. It is unlikely that they were exposed to any western education system. They are more likely to struggle in adjusting to life in Canada than immigrants from urban areas. Most parents aspire to the success of their children in Canada. However, their children may continue to suffer and feel isolated. In the school system, children may feel that they are not valued, and that they are outsiders within the student population. Their teachers may complain about Somali students’ behavior and actions. These circumstances have contributed to some Somali students feeling hopeless about their future, developing aggressive behaviors, and exhibiting a lack of interest in school. Understand the needs and challenges facing newcomers. Support new students and build their self-confidence. Assist students to reduce the sense of fear that often characterized their lives before coming to Canada. Value new students and build their sense of belonging in the classroom and the school community. Exhibit positive attitudes towards and acceptance of Somali students. Facilitate students’ and parents’ adaptation and adjustment to the new school system. Ensure a safe school environment, free from racism and bullying. Value and respect the culture and beliefs of Somali newcomers. Establish collaborative networks with parents and students. Establish and maintain communication between the school and the Somali community. Another way to establish a greater understanding of Somali culture is to explore the resources available to the community in your town or city. Why not try having a meal in a Somali restaurant, or shopping in a Somali grocery store? We have provided a list of places that provide services to the Edmonton Somali community. “Where are we going wrong?” This is a common query that teachers and school administrators have when they are less successful than they would wish to be in involving immigrant parents in the school community. Fortunately, we discovered some potential new ideas through our discussions with members of the Somali community during the “Strengthening the School-Community Connection” program, and became even more aware of the need to listen carefully and respond sensitively to the messages and concerns that Somali parents share with us. As a result, we were able to develop a variety of strategies, some potential meeting topics, and community resources that could support families and assist schools to increase Somali parent involvement in the school community. Our strategies are centered around making initial connections with the Somali community and then extending and enhancing those connections. We have also provided three appendices that list additional resources for further consideration. We encourage you to adapt and modify these strategies to your individual context as you build your own framework for addressing the needs of the Somali families in your own community. First, it is important to reach out to Somali families and invite parents to come to the school and become more involved. Whenever possible, this should be done with the support of intercultural consultants and other community leaders. Through these meetings, schools may be able to identify school and community concerns that could be addressed collaboratively. Second, once parents have made the choice to participate in such discussions, school personnel must be sensitive to the cultural practices that are fundamental to the Somali culture. Ignorance of Somali culture increases the risk of school staff members unintentionally offending and perhaps derailing the development of these new and fragile relationships. First meetings might be more successful if they were organized and chaired by someone from the Somali community. School personnel would assume the roles of participants in the meeting, acting as representatives of the school instead of leading the meeting. Third, it would be helpful to find other opportunities to meet and communicate with families. This would support the development of strong families and support the students in our school communities. Schools could invite other community agencies to work with them to support Somali families. Co-hosting parent/family information sessions at the school would be one strategy for increasing communication opportunities. Since oral traditions are an important characteristic of the Somali culture, it may be ineffective to send parents written invitations to come to the school, even if the invitations are translated into Somali. Instead, Somali parents would likely be more receptive to personal invitations made by phone. These phone call invitations could be made by intercultural consultants or by some of the Somali families within the community. Through the phone fan, parents could be invited to participate in the parent council meetings. In order to assist Somali parents who do not yet feel comfortable with these types of meetings, it might be beneficial to invite parents to come to the school prior to the meeting’s beginning. Parents could then be briefed in Somali about the meeting topics. If they had comments, questions or concerns for the school, an intercultural consultant or a community spokesperson could ask those questions on behalf of the parents if they did not feel comfortable doing so themselves. In addition, it is likely that meeting attendance would be increased if the pre-meeting time was seen as an opportunity for eating and socializing. Not only do these activities help to build relationships, but they honor traditional Somali cultural norms for gatherings and meetings. Since some parents may be coming directly from work to the meeting, and may not have afterschool childcare, providing food and activities for children of all ages may help to foster parent participation. Because many Somali parents drop their children off at school, it might be beneficial to provide a space in which parents could meet, have a cup of coffee or tea, enjoy conversation, and access support from another community member if they are experiencing challenges. This space could also act as a location where parents could receive English as a second language instruction through a conversation club, access a clothing exchange program, or find out about community services that would support their families. The establishment of a community hub could encourage parents to spend time in the school, and assist them in becoming comfortable enough to forge relationships with the school staff. It is important for schools to ask parents and Somali community leaders to identify the community’s needs. Schools could then collaborate with other community agencies to support parents in addressing these. A community immunization program, eye examinations, assistance with forms, taxes, and applications for housing or schooling are examples of services that could be offered. Formal informational sessions could include such topics as finding out about Registered Educational Savings Plans, scholarships, parenting strategies, or the criteria for high school graduation. The Somali community should not be viewed from a deficit perspective, as each community has cultural wisdom and strengths that can enrich our schools and our ability to reach out to the families of students that attend our schools. Community strengths, therefore, need to be identified, emphasized and utilized within the school to guide the implementation of culturally appropriate activities. A Somali as a First Language tutorial program could be held in the school during non-instructional times. Also, community leaders could be invited to the school to talk about their work and act as positive role models for Somali youth. As the teachers of immigrant students, we tap into many informational sources as we strive to create the best possible educational experiences for our students – our past instructional experiences and those of our colleagues, professional development presentations, and content area journals. However, one source of knowledge we may forget to consult are the students whom we hope to engage with our teaching. Our students can provide us with their unique perspectives , thoughts and feelings that accompany their newcomer experiences, which we can in turn use to inform our teaching approaches and therefore, better serve our students’ affective and academic needs. The following selections were written by Somali high school students about their experiences arriving in Canada. They produced this writing as part of an in-class assignment in which they were responding to a short story about a girl who had moved from Cuba to the United States. Switching schools can be difficult for young people at the best of times, but when the change involves adjusting to an entirely new language and culture, it can be overwhelming. These students have offered to share their writing to help Canadian teachers understand their experiences and feelings as they worked to figure out a new school in a new country. The voices of the students highlight their individual thoughts, impressions, experiences and concerns as they adjust to life both inside and outside the classroom in their new culture. Although they are all Somali, and proud to be so, the differences in their observations act as an important reminder to teachers that immigrant students must be treated as individuals, even if they are members of the same cultural group. Perhaps the strongest theme that runs through the students’ writing is their need to connect with friendly faces among the students or staff in their new schools. Initially, many students feel vulnerable in the school environment, as if people are ignoring them, or even laughing at them. So, it is understandable that making a first friend represents a turning point in the lives of some students, both inside and outside of school. One friend can help a student negotiate life in the halls or lunchroom. Many students talk about their first friend as opening the door to other friendships. Some students give an early friend credit for teaching them English, and generally increasing their language learning, in various contexts throughout the day. The importance of making friends points to the need for teachers to find ways to support relationship building within the classroom. Teacher observations during class breaks could help identify new students who may be feeling isolated. Opportunities for structured peer interactions might help these students develop new relationships. One student gives her teacher credit for helping her make a friend, by suggesting a partner for an in-class activity. It may be helpful to ask one student to act as an orientation mentor to a new student during his or her first week in school. Ice-breakers and partnered learning activities could be helpful in giving new students a chance to connect with more than one student in the first few months. Understanding the significance of social relationships for immigrant students may encourage teachers to be tolerant of occasional off-topic conversations during class time. These conversations may be a crucial stepping stone to getting settled in a new school community. As a follow-up technique to these various relationship-building strategies, teachers could schedule one-on-one conversations with new students after their first month in school to see how they are adjusting. Asking at an early parent-teacher conference whether the student is making new friends could help identify the need for individualized social opportunities based on the student’s existing interests and talents. These are only a few strategies that you could use to help the immigrant students in your classroom feel more at ease in your school community. We hope you will think of others as you read the students’ words. More importantly, we hope that you will find ways to access your own students’ voices, listen carefully to their words, and consider ways you can act on their insights to support and ease their integration into our school communities. We believe the results will be worth the effort. DuniaWhen I first came to Canada, I started school in grade 6. I was scared because I never went to school with white people and people that speak English. There were no people that understood me. The people were friendly and kind and good-looking but I didn’t know what they were saying. I got mad. I thought that they were being mean to me. Finally, one day, a Muslim girl named Selma came to my school. She looked nice, beautiful and was helpful to me. She was tall and shy too. But if I was friendly to her, she would talk to me. She talked to me in Somali but talked English with the other girls. She never left me behind. When I had her, I wasn’t lonely and shy anymore. She changed my life. I love her so much and miss her when she is not with me. She is good at soccer, really good at soccer and basketball. So I tried being nice and happy, so that the girls won’t think I am crazy. The girls told Selma what they were saying and she told me in Somali. I was happier. Selma taught me English day-by-day. It kind of took me a long time to learn English. I learned some words, so I said thank you to Selma. It was really nice of her to teach me English. We all became friends. We played sports after school and went to each other’s houses. No matter where I go I always remember them. I liked her for who she was. It didn’t matter to me how they looked. Now I have new friends, I have to treat them all the same. Treat them the way you want to be treated. Ajay“When I came to Canada, my life changed. Everything is different, the houses are different and beds are different. Then I went to school. I made new friends and my friends changed my life. They taught me their culture of this other country and I had never learned these new things. After that, one day my friends and I went to the mall and one of my friends told me to steal something. My other friends told me not to do that because I am new to the country. The guy who told me to steal, his name is A– and my other friend is Mohamed. A– and Mohamed had a fight because A– wanted me to steal something so I can get in trouble. After, when I learned how to speak English I started to hang with Mohamed not A– . A– is a bad person and he always gets me into trouble but Mohamed always tells me to stay clear. One day, A– came to me and asked me if we can go to the mall and steal something. I told him, “I am not hanging with you anymore.” Because he is a bad person and I said, “We are not friends any more.” Mohamed is a nice guy and funny but A– is a bad person and always acts like a gangster. Gigi“My name is Gigi, I’m from Somalia. I moved to Canada. When I moved to Canada I had to make a new life and follow new rules. Everything is new, everything is strange, and everything is different. I have to go to a new school and see new people, to make new friends. So when I started at a new school, I thought I’m going to see only white people. I was surprised, I saw mixed people like African people, Chinese people, and I was so happy to see all those people. I wanted to know if they were nice or not nice. I was so scared to talk to them. I didn’t talk to anybody. I wanted to, but because I was scared to talk to them, but I smiled for them. I wanted to see who’s nice and who’s not nice. When I graduate, I want to be a nurse. I want to study at the University of Alberta. I would like to be a nurse because I like to help people. I’m glad to be in Canada because I can easily study to become a nurse. After that, the next day, we came to Edmonton. Then I started to go to school. At that time, I didn’t know how to speak English and my friend was laughing at me. Then, the first two days, I was sad because I didn’t know how to speak English. After that time, I started to speak English but not too much. Then I started to make friends at school. They started to love me because I was making something fun and they were laughing at me. I became friendly. They started to make me, his or her friends. My sister started to go to school and she’s doing a good job and that’s good for her. She’s starting to speak English but not too much. Samiir The first time you come to a new country that you like, it seems like you are in the right place. It is the place you wished to go but still you need help for everything like; money, a house, buying food and visiting your parents. It’s even hard to go anywhere without a car. You need to have a car, if it’s your car or your families’ car. Where ever you go, whatever you see, when you come to a new country, everything is strange and everything is different and everything is hard. There are three things that are always together; a new country, a new life and new people. Those three things are always together while you are in the world. Abdullah When I was in Fort Saskatchewan for the first time, I saw different stores and different people and different schools. The next day, I saw in the city, different jobs and different homes. They really are nice homes.